Every year we plot mange occurrence on our database, this we then link to the UK map. This gives us a visual of where Sarcoptic mange in foxes is occurring. 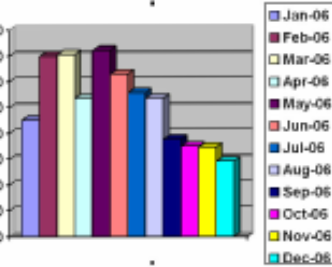 Plotting mange occurrence on the database gives us an indication of not only where it occurs but in what month and whether over a period of years any particular months stand out or any particular area. Below you will see the requests for treatment in each month of the year shown from 2005 through to 2017. 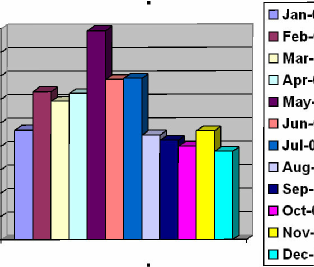 From studying the graphs we can clearly see the time we get most reports regarding mangy foxes is May. This may have something to do with the fact that cubs born in April will in May be above ground, so the fox population as a whole as significantly increased, hence more people are seeing more foxes and more people are reporting the mange if it is present. What, after studying these figures we will now do is find out whether the requests for treatment are indeed for adults or cubs. 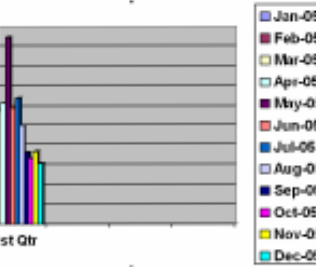 A significant drop in requests for mange treatment is noted after August, whilst we could conclude that mange drops in the colder months, it could also be something to do with the darker nights, so any analysis of details is hard. From the end of August onwards the darker nights could be the reason why the requests are significantly less, however if this was indeed true one would expect the same results for January, February and March. 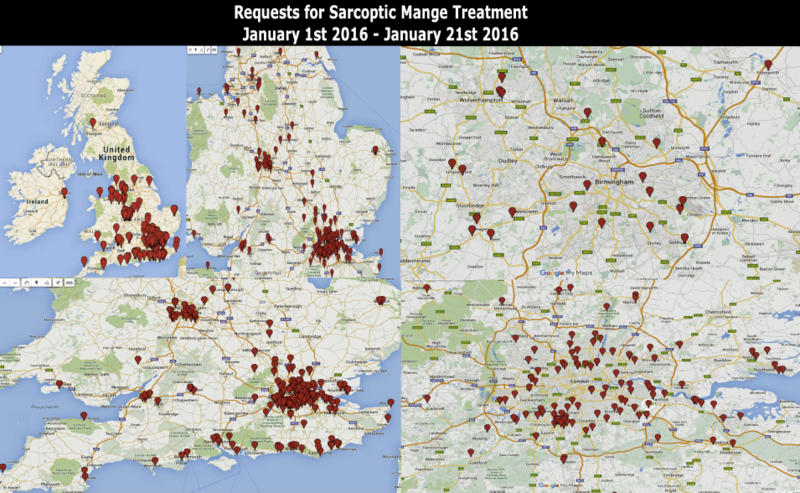 These maps show the mange occurrence across the country and the busiest areas we deal with predominately, London, Essex, Middlesex, Surrey, Bournemouth, Birmingham, Southampton and East Sussex. Please note: The maps shown on both of these pages and the occurrence plotted are from our database only. 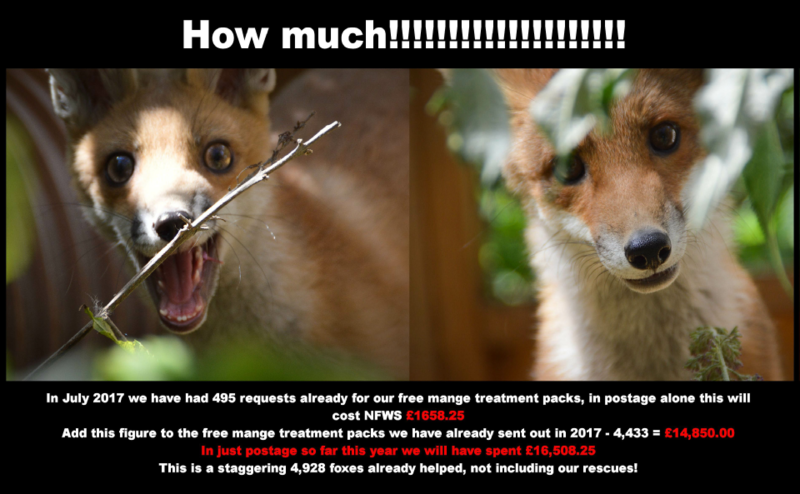 Other fox rescue, wildlife rescue organisations will no doubt be dealing with cage traps and treatments in areas already shown and also those not mentioned. 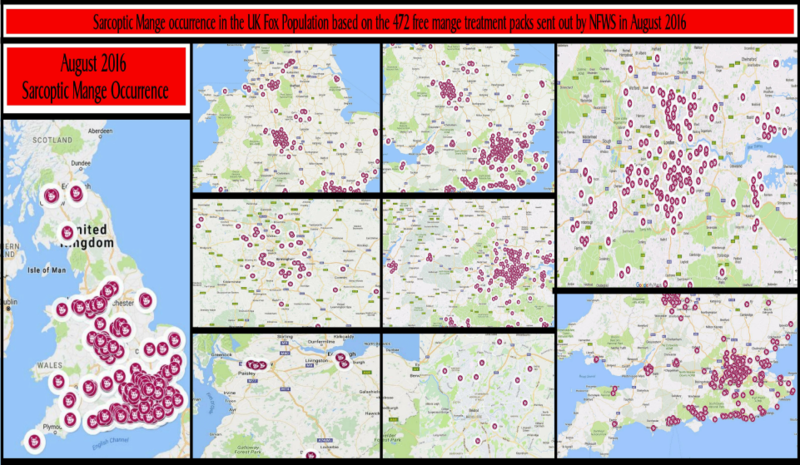 These maps are only provided for reference and do not claim to show the full mange occurrence for the UK fox population. Many farmers, landowners etc will not think or will not be willing to call upon an organisation that is there for the welfare of foxes, and they would prefer no doubt, to deal with a mangy fox, the only way they know how. Therefore many of the places mange may be occurring in the countryside we have no way of recording. 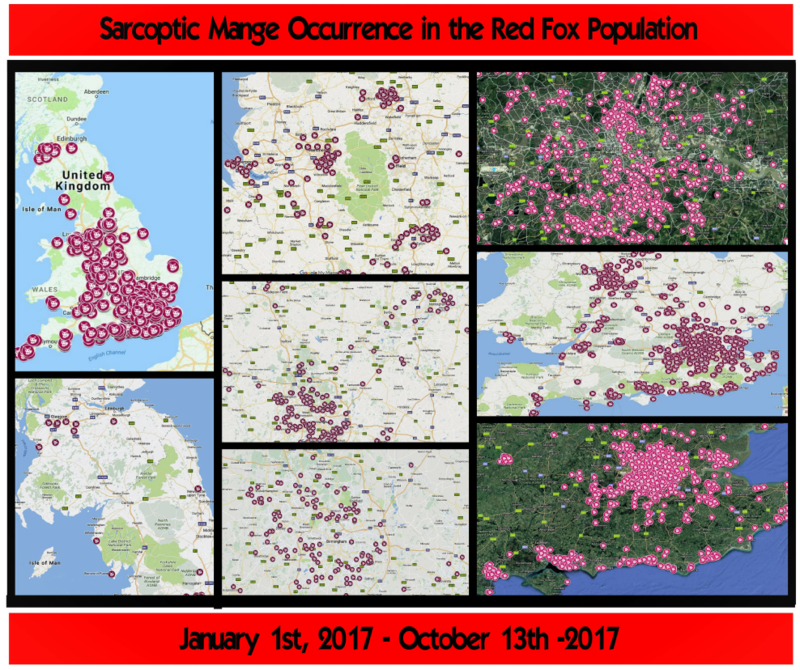 These figures and maps given are only from the occurrences of Sarcoptic Mange in foxes based on the calls received from the National Fox Welfare Society. Throughout our research there has been no significant increase in fox numbers and or foxes suffering from Sarcoptic Mange. If you see any of our site content on other sites, that do not credit our Society then this permission has not been granted, and we do not endorse the site, or the organisation behind it.